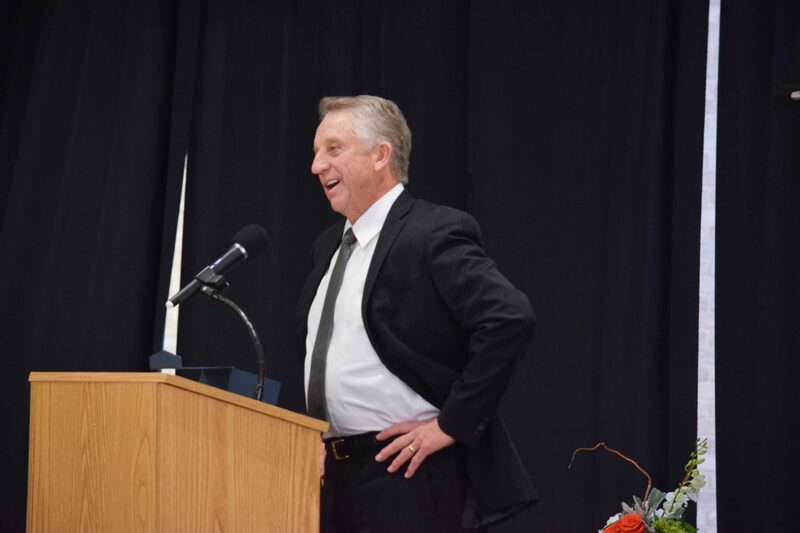 Former Pan American College baseball player Ricky Brockway speaks at the podium during the 2018 UTRGV Athletics Hall of Fame induction ceremony on Saturday, Feb. 25, 2018, at the UTRGV Ballroom in Edinburg. EDINBURG — Ricky Brockway was a two-time All-American, set eight Pan American University program records, was a part of the team with the best winning percentage in program history and went on to play for the Chicago Cubs, but he said the proudest moment of his career came on Saturday. 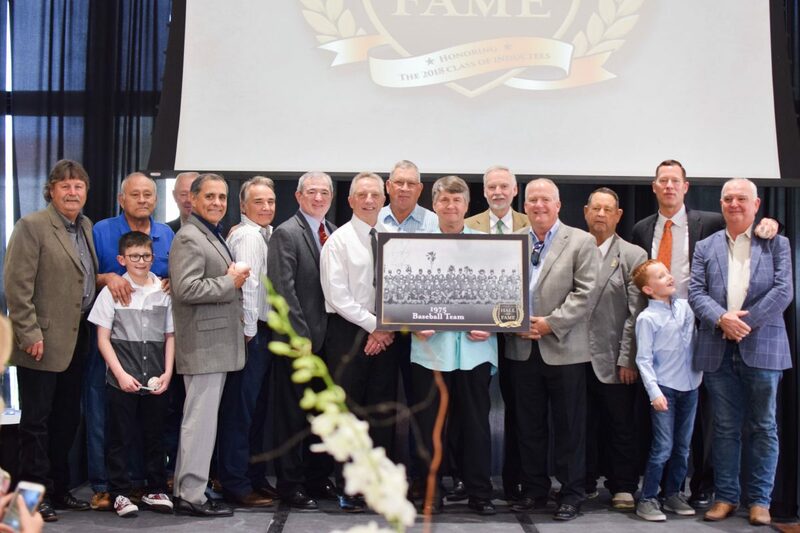 That’s when he, along with four other individuals and his 1975 baseball team, were inducted into the UTRGV Athletics Hall of Fame during a ceremony in the UTRGV Ballroom. During his time with Pan American from 1974-75, Brockway set the program records for single-season and career runs, steals, walks and assists. The 1975 Pan American College baseball team poses for a photo during the 2018 UTRGV Athletics Hall of Fame induction ceremony on Saturday, Feb. 25, 2018, at the UTRGV Ballroom in Edinburg. He was a two-time NCAA All-American and a two-time AABC All-American. Sebek said Brockway was the team’s “kingpin” — a leader and the primary reason for the group’s success. Brockway also developed a reputation for having a jab or practical joke ready at a teammate’s expense. The group went 63-7 including a 20-game win streak, posting the highest winning percentage in program history at .900. Brockway became the seventh player from the group to be inducted into the UTRGV Hall of Fame, joining pitchers Ewing, Rod Edquist, Jesse Trinidad and Jim Proctor and position players Bobby Rutledge and Tommy Simpson. Head coach Al Ogletree and assistant coach Reggie Tredaway, who introduced the group on Saturday, are also in the Hall of Fame. Tredaway was a player on the 1971 Pan American team that advanced to the College World Series, but on Saturday he said the 1975 group was even stronger. Ewing said the team was confident and cohesive, with depth at every position and the ability to fill in for each other’s shortcomings. Not until years later did he realize how special the experience was on and off the field. The team’s run came to an end in the NCAA South Central Regionals with a loss to Texas — the eventual College World Series champion. Ewing said the team’s only mistake was allowing Texas a big first inning. Pan American closed the gap but never pulled back ahead. Also inducted to the Hall of Fame on Saturday were Mire Chatman (men’s basketball, 2000-02), Tonya Garcia (track and field, 1990-93), Alex Gravel (women’s basketball 1998-03) and Leah (Viloria) Hampton (women’s tennis, 1987-91). Additionally, program supporters Dan and Terry Martinez were inducted to the Hall of Honor. Chatman was an honorable mention All-American, the Independent Player of the Year, Independent Defensive Player of the Year and the UTPA Male Student-Athlete of the Year, among other honors. He grew emotional at the podium when looking back on his career and drew laughter from the audience when he recounted how he was thrown out of his career-best scoring game — 46 points against Texas A&M-Corpus Christi — when he picked up a pair of technical fouls with about five minutes to play. He also reminisced about UTPA’s attempt to get his attention during the recruiting process. Gravel held the program scoring record for nine years and now ranks third with 1,227 career points. She still holds the program record with 258 career 3-pointers, shooting as high as 42.6 percent from beyond the arc in 2002-03 and making as many as nine in a game, in 1999. Hampton is the program record holder in overall career wins with 109, including a then-program record 64 singles wins. Her presentation was highlighted by a video message from her son, Nathan Hampton, who is a sophomore on the tennis team at Division I University of the Pacific in Stockton, California.